Where to begin with this review? This book left me at a loss for words. To read the story of a young Muslim girl who, after accepting Jesus Christ as her savior and vowing to live for him, must flee her family in fear for her life, would render anyone speechless. This book was incredible. 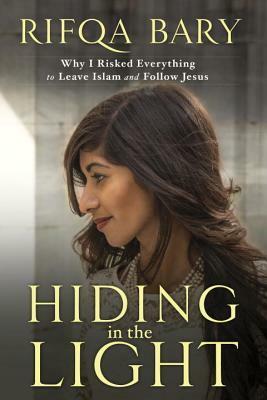 Hiding in the Light tells the story of Rifqa Bary, who was raised in Sri Lanka by devout Muslim parents. She was blinded in one eye as a young child and constantly abused and rejected by her family. After moving to the US, her family still practiced their religion, but Rifqa became curious of her friends who would pray in a way that seemed so easy and genuine, and with a strange word, “amen.” Rifqa came to accept Christ as her savior but was forced to keep it a secret from her family. Eventually her father found out, and told her if she didn’t turn back to Islam from Christianity he would kill her. What came after that terrifying night is something so crazy and surreal that without the grace and mercy of Jesus, and the precious people he put in her life, Rifqa wouldn’t have survived. I really can’t write a review worthy of the emotions this book made me feel, so I can only tell you to read it. It will touch your heart, and remind you of the glory and unfailing love of Christ with each turn of the page. Thank you to NetGalley and WaterBrook Multnomah Publishers for the opportunity to read this book. All opinions are my own. I was given a copy of this book in exchange for an honest review-thank you! I really enjoy Greek mythology, so when I saw the synopsis for this and the fact that I had a chance to read it for free and give a review, obviously I jumped on that! The thing that bothered me the most was how slow moving I felt this book was. While I did mostly enjoy it, it took me awhile to finish because some parts dragged on. I also felt the supporting characters fell flat. While I was disappointed with that, the story was just such a cool and unique take on the myth that I still really enjoyed it! The way the author described the Underworld really transported me to that mythical place. I’ve seen a lot of reviews that remark on how this book didn’t seem to flow together with all of the myths and history and this and that, but it’s fiction-it was fun and unusual. Also, the author explains at the end that she didn’t focus on accuracy and there were certain ideas she liked from different cultures that she wanted to fuse together. So, if you want a “historically” accurate modern retelling of Hades and Persephone, don’t read this. If you just like Greek mythology, creative retellings, and magical freaking oranges, then read this book! I look forward to reading the next one in the series!